Note: Specifications listed are meant only as a guide. Each user must test the tubing under their operating conditions to determine the tubing’s suitability for the particular application. Omega’s TYUTH95 Series polyurethane tubing is resistant to chemicals, water, fuel, oil and fungus. This product is extremely flexible and highly resistant to abrasion and kinking. In addition, polyurethane has excellent "memory" and can be stretched and flexed, but will return to its original shape. Omegaflex® air line tubing is made from 95A shore durometer, ether-based polyurethane and is an excellent choice for compressed air systems. It is ideal for Push-to-Connect airline fittings and easily attaches to pneumatic valves, air filters/regulators, pressure relief valve, and airline lubricators. 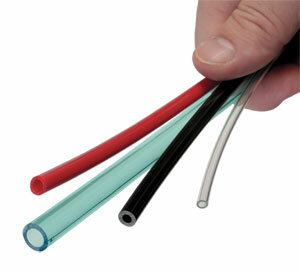 This extruded tubing is a good choice for air tools and accessories. 참고: Standard color is natural (clear). See Color Option Table for color availability and ordering codes.